Timeline ROTM-1 includes the events of Timeline JD-1 and goes beyond it to include the events of Terminator 3: Rise of the Machines and tie-ins leading up to that film. In 2032, a T-850 Terminator has been reprogrammed by the resistance with a very special mission. Skynet sends a new type of Terminator into the past to kill John Connor's future officers in the war. Timeline ROTM-2 includes the events of Timeline JD-1 and goes beyond it to include an altered version of the events of Terminator 3: Rise of the Machines, in the form of the story of the video game Terminator 3: The Redemption. A T-850 begins an alternate version of Rise of the Machines. Timeline ROTM-3 includes the events of Timeline JD-1 and goes beyond it to include the events of Terminator 3: Rise of the Machines and tie-ins taking the timeline into an alternate future from the one presented in the 2032 of Rise of the Machines. Rise of the Machines "Before the Rise"
Part 1 "Before the Rise"
Skynet sends a new type of Terminator into the past to kill John Connor's future officers in the war. The resistance captures a T-800 in order to reprogram it for a special mission. The resistance struggles to reprogram the captured Terminator to protect human lives rather than take them. In 2029, John Connor makes a decision to use a comrade's ability to mentally travel back in time to aid in the survival of humanity against the machines. In 2029, John Connor and the resistance learn that Skynet is preparing a T-X to be sent somewhere back time to prevent or end his existence, so they formulate a plan to stop it by making Skynet send the T-X after him now. Timeline ROTM-4 includes the events of Timeline ROTM-1 and goes beyond it to include the events through Terminator 3: Rise of the Machines, then continues with an altered version of the timeline in which Kate Brewster dies inside Crystal Peak in 2007, leaving John Connor to emerge alone. "Heralds of the Rise" Rise of the Machines "Infinity"
In 2032, a T-850 Terminator has been reprogrammed by the resistance with a very special mission. Skynet sends a new type of Terminator into the past to kill John Connor's future officers in the war. In 2033, Skynet lies all-but-defeated and enacts a last, desperate gamble to correct all errant timelines; in 2009, John Connor finally emerges from the Crystal Peak bunker. In 2009, the T-Infinity attacks the L.A. resistance cell. In 2009, John Connor leads his first attack against Skynet. John comes under suspicion when the resistance cell discovers that Uncle Bob is a Terminator. Can John press on with leading the resistance after the loss of Uncle Bob? Six years after their last encounter with the T-Infinity, the Resistance faces the ultimate Terminator once again. New Orleans, 1996, finds two John Connors fighting for survival. John Connor meets John Connor in 1996! 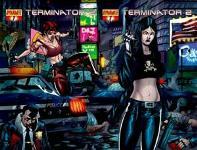 Things seem to be coming to a zero point for the Connors and Terminators in 1996. The assembled Connor family of past and future faces a showdown with the T-Infinity and the Dire Wolf. Timeline ROTM-5 includes the events of Timeline JD-1 and goes beyond it to include the events leading up to Terminator 3: Rise of the Machines and an altered version of the that film in which Skynet was apparently stopped and human civilization continues, with John Connor continuing to hide. In this timeline, it seems that John either was not reunited with Kate Brewster or she was killed or separated from him sometime before the events of Fragmented. "Heralds of the Rise" Rise of the Machines "Fragmented"
Part 2 "Time to Kill"
In 2032, a T-850 Terminator has been reprogrammed by the resistance with a very special mission. An altered version of Rise of the Machines takes place here, one in which Kate Brewester does not become involved with John Connor and Judgment Day does not occur in 2004. Skynet continues to disrupt the timeline in its quest to destroy John Connor. John Connor contends with two Terminators. But which is friend and which foe? 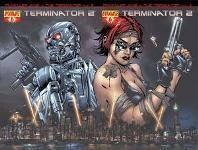 The resistance uncovers a new dual-plan by Skynet to send Terminators into the past. Part 3 "Time to Kill"
The Terminator wreaks havoc in 2008. When the Terminator in 2008 finds out Jane's identity, it adjusts its mission. In 2029, John determines he must send Vanessa back in time to confront the female Terminator.